I have always hated going to the gym. While most for people it boosts their morale, and made them much more alert, I found I always left feeling not good enough. It surprisingly became much more difficult as I got older, and I wanted to find another way to work out that didn’t involve lifting weights. I looked everywhere for a new way to especially work out for my cardiovascular health, as my family has a history of heart disease. I tried running and biking, but both of those bored me and I needed something that would continuously engage my brain. That is when a thought dawned on me: I needed to play sports. I have always been a massive sports fan, but never had quite the knack for playing any sports when I was a child. That never stopped me from always having a favorite team in every league, and attending as many live sporting events that I could afford. I loved the environment, I loved the thrill of it, and I loved watching players who excelled at their craft. So, when I decided to start a new sport I turned to the one that I thought would be the best workout, and that was also my favorite to play: soccer. I have loved soccer ever since I was a child and my parents signed me up in a little league when I was five. Even though I was young, I still have fond memories of playing soccer, and decided it was time to start playing again in a beginner league. There is no shame in being a beginner at anything, even when you get older. I find so many adults are scared to try something new because they don’t want to embarrass themselves; I assure you: You will be completely fine! Embrace the fear of starting something new and just go and have fun, especially when it comes to playing sports! When you start playing soccer, you must start improving your personal skills. Even if you are a more advanced player, going back to the basics every practice and simply focusing on dribbling, passing, and shooting, will always be beneficial to any player! When I signed up, I began searching around for soccer drills for beginners. In the league I was in, it was basically always just showing up for a scrimmage match, and there was not much else to it. 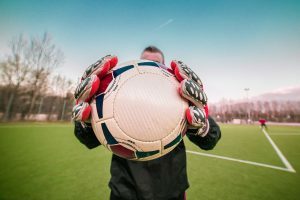 While this was a lot of fun, and a fantastic way to get in shape, I craved getting better at this new skill set, and I set out to find a great tool to help me find soccer drills for beginners. These days, you can basically find anything you want on the Internet, especially when it comes to training for soccer. There are multiple tutorials on YouTube, and multiple training systems that you can purchase that will be directly put onto your computer. It can be a daunting task to try and find the best one, and that is why I will share with you the one I bought and used with fantastic results. “The Epic Soccer Training System,” is the number one solution to fast improvement in your soccer skills. When I started using it, within a week, I was already a far better player than I was before. I could dribble the ball much more dynamically, was far more accurate with my passing, and I developed power when shooting the ball. This system was completely affordable, easy to learn from, and provided the best soccer drills for beginners. It also has been built for professional players as well, so you will never stop growing and learning after buying this product. Now, of course if you can't afford the “Epic Soccer Training System,” then that's fine as I've searched through the hundreds of videos and resources that you'll find on Youtube and the internet and listed my favourite drills for beginners, that I've collected and used with both my Youth Soccer Clubs and and for players just starting out in their career. Key to developing your skills as a soccer playing is working on your touch. This will help you in all aspects of your game from receiving passes, making space, deceiving opponents and generally giving you more time and confidence on the ball. Once you've mastered your touch the next logical thing for you to work on is your passing skills. This video is a great drill to start your team focusing on short passing​, and practicing one touch passing with both feet, which will help you move quickly as a team and transfer from defence to attack. In the long term you'll learn how to hit long cross field passes, but to start with, focus your efforts on short passing and finding a team mate like they show in this video. OK, so you've been working on your touch, and passing drills, but occassionally you're going to need to dribble your way out of trouble. Typically you're going to need to dribble well if you're under pressure and have no team mates nearby, if you need to beat a man and bare down on goal and also you'll need to learn to run at pace and keep control of the ball so these beginners dribbling drills really help you set the foundations for all of these techniques. ​In the top video you they've set out a series of cones in a circle, which is a great formation for you to practice with. You can practice this drill anywhere and this will really help with your dribbling skills, balance and overall confidence on the ball. If you don't have any cones, then put some sweaters on the floor, or try dribbling around a series of obstacles in your house with a tennis ball. Remeber, the best practice you can have is to always have an object at your feet. If you don't have a ball near you, kick a stone along the street, but just get used to the feeling of controlling the object and moving that between both feet. The final skill that you'll need to master, and some might say the most important skill is shooting. If you're not scoring any goals, then your team is going to struggle. My main tip for those starting out is not to focus on the power of the shot, but the direction and accuracy of the shot. When you get a shooting opportunity, try to remain calm and gently stroke the ball into the goal rather than smashing a hole in the goal net. If you talk to any professional soccer striker then they'll confirm that how you score a goal isn't what matters, it's the ability to score a goal that really counts. As I'm sure you'll find out, there are hundreds of drills out there and if you're a beginner then the choice can be quite overwhelming, which is why I selected some simple soccer traininng drills to help you improve all aspects of your game as a beginner. I am happy to say that now I have “graduated” onto a much more competitive league of soccer for young adults. I have gotten in extremely great shape without having to go the gym, and have strengthened my skills as a soccer player; this is mostly because of “The Epic Soccer Training System” that I use day in and day out. It is so good that I recommended it to my entire team, and we decided to meet outside of games to practice the soccer drills that came with it. We are now the number one team in the league because we committed to the system and never stopped!